Just this past October, the Marriott Group welcomed its first Alexa in guest rooms in North Carolina. However, this isn’t the first time Alexa has been in hotels. In 2016, Wynn Resorts installed over 5,000 Alexas in their rooms. Alexa, order one more towel. Alexa, turn on the TV. Alexa, book a spa appointment. Alexa, help me check out. This simple integration of Alexa into existing services and amenities can bring guests’ experiences to a new level. 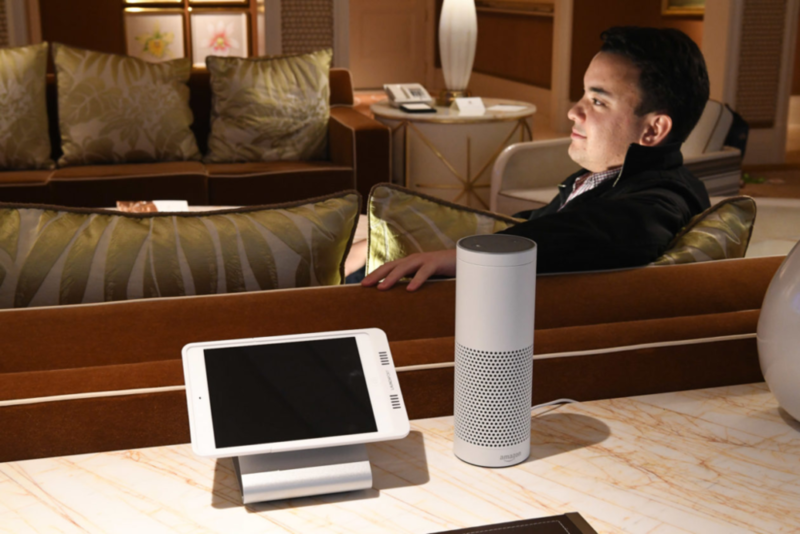 Now, guests will even be able to connect their Amazon account to their hotel room’s Alexa and will disconnect once they check-out. Now, it’s not just Amazon and Alexa taking over the hospitality voice market. Recently, a provider of digital guestbooks for private accommodations, Hostfully, partnered with Virtual Concierge Service to integrate Hostfully’s guidebooks into voice assistants. Property managers are also using voice applications. For example, property managers are buying smart kits and installing them into their lighting controls synced to voice. Some property managers have even recorded their own personal recommendations to guests. It’s all about the ease of communication between guests and property managers. These are just some of the many ways voice assistants are innovating the hospitality business. The Alexa for Hospitality system is a tool itself where hotels can update information, enable skills, adjust settings, and even track usage. It will even allow hoteliers to measure guest engagement through analytics and reporting. revenue management system which makes for hotels to tap into the data they need, but using simple and recognizable voice commands. Because of voice technology, hoteliers can access their data anywhere. Right now is the perfect opportunity to jump integrate voice into your hospitality business. We’re here to help enhance your guests’ experiences. Here at Bluefin, we can customize your guest’s experiences by building you a custom voice application. Don’t be the last one to check-in, call us now!